When most people think about optimizing their Google Shopping ads, they focus on optimizing their campaigns, bid strategy, and execution. While this is important, we’d argue that the more significant wins come from optimizing your data feed. Your data feed is a subset of all of your products. It’s a digital product catalog that contains attributes like product title, description, GTIN, category, and more product data, etc. This is what’s used to determine how often and for what keywords you show up for. Google Shopping consists of two products – Google Ads (formerly AdWords) and Google Merchant Center. Google Merchant Center is where your product data feed lives and Google Ads is where you can optimize your campaigns, set your budget and adjust your bid strategy. Part 1: Data Feed Optimization: Getting your data feed optimized is the foundation of successful Google Shopping Ad campaigns for eCommerce companies. Most guides on this topic don’t cover this in-depth but we’ve dedicated an entire part to this step. We’ll outline our experience in how to properly manage Google Shopping ads for hundreds of eCommerce companies. Why Does Data Feed Optimization Matter? The more information that you have in your data feed, the more relevant you are for people’s searches. In turn, Google will reward you by showing your ads more frequently and for less money. Optimizing your data feed is like building a house. The data feed is the foundation on where you build all of your Google Shopping campaigns. If the foundation is off or your data is bad, you will have a hard time performing well on Google Shopping. Here are a few things that happen when your feed isn’t optimized. You won’t show up for certain search terms. Your competitors will take up more space than you. You won’t get correct visibility which could lead to overspend. For example, say you sell Nike shoes. If your titles only contained basic information, such as: “Nike red shoes” and didn’t contain size information, color information, or model information in your product title, then you would not show up for some of the highest intent relevant search queries. If you did end up showing up, you would be spending a lot more for that ad than competitors who implement a data feed management strategy. If you did end up showing up, you would be spending a lot more for that ad than competitors who implement a feed optimization strategy. The GTIN is the UPC of the online world. When you’re a reseller or a manufacturer of goods, you use that information to track your products across Google’s Surfaces and to keep an eye on MAP pricing through the Manufacturer Center. The only time that you don’t need a GTIN is if you’re selling one-off goods—meaning you sell one-off antique furniture, used products, or when you’re selling things as a bundle. When you have the GTIN, it’s important to include it because of all the information it provides. One of the biggest mistakes that we see brands making is keyword stuffing their titles—and it ends up backfiring. Google will penalize you for long titles (i.e., anything over 75 characters). If your title is over 150 characters, they won’t approve your ad. Product title optimization is important because Google Shopping is all broad match. There’s no phrase or exact match. The algorithm uses the title to identify what the person is actually searching for and matches those keywords with the feed. The key is to be precise and include the most relevant information in your titles. However, it is important not to keyword stuff your titles. Your title should reflect how your customers or prospects are already talking about your product. For example, if you sell jeans, you need to include all of the main keywords in the titles, such as: ‘Men’s Levi’s Boss Jeans Size 34’. The more relevant information that the user includes in their searches, the more likely they are to buy. 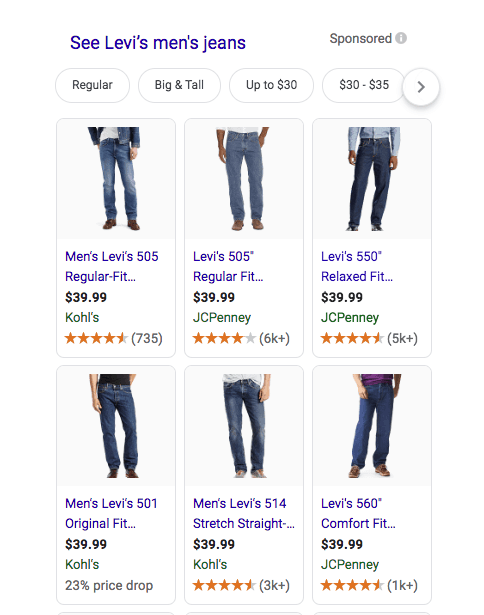 If your product title is only “men’s jeans” you’ll appear on all of the general searches, but you’ll miss out on the higher-intent searches that are the most likely to result in a purchase. This can happen when you directly import the titles from your Shopify store directly into Google Shopping without optimizing them. If you are having issues optimizing your feed or just want a second pair of expert eyes on it, you can reach out to us and one of our Google Shopping experts will help you out. In our experience, Google is increasingly putting more relevance to the product types. They contribute to the overall “quality score” of your data feed. We recommend you follow the structure/breadcrumbs on your website. This is the best way to get proper visibility over all your products. The product category is how Google categorizes products inside Google Shopping itself. Because there are over 6,000 default Google product categories, we recommend you get as granular as possible. Some of these categories can go down five tiers or more. You will want to use a categorization tool to help you with this. Here is a full list of categories to help with this process. For example, if you sell reading glasses and you haven’t optimized your product categories, your products might be showing up under drinking glasses instead of reading glasses. The description for each individual product carries less weight than the other four attributes above because it takes about two clicks to see (as opposed to the title, price, and brand, that show up immediately in the shopping results—without any additional clicks from the user). However, this is still worth optimizing because of its use of added relevancy. Put your product title at the end of your description. Identify added HTML that was not removed. There are many times that these pieces of code will get caught in the description. With text ads, you can see a quality score, such as an 8 out of 10. However, with Google Shopping campaigns, you don’t get a numerical score. Instead, you have the Google Merchant Center. The Merchant Center acts as a QA source to make sure your data is clean and accurate. When you upload your data feed into Google Merchant Center, you’ll see errors, warnings, and disapprovals. While Google will still show your ads for certain searches, it will end up costing you more money in ad spend than your competitors who have optimized feeds. So, when you start seeing these errors come in, you want to clean them up ASAP. There are three different levels of issues in the Merchant Center—by account item, feed, and account level (with account level being the worst). Account level warnings can lead to larger issues such as Google shutting down your Merchant Center. If you get an Account Level Warning, such as a verification issue, you should fix it immediately so that you can keep your ads running. There’s also a feed check, where they’ll go through your data feed and make sure it’s delimiting correctly, and all the files are set up and readable. SKU or item level warnings are at the specific product level, meaning that they’ll go through all of your products. They’ll let you know if you are not including specific attributes, and give you a warning or a recommendation. This is where most issues are found and will need to be fixed in the data feed. To improve your campaigns, get in the habit of updating your feed anytime your product prices, availability, or inventory levels change. For example, if you sold 500 products last month and now you are only selling 350, you need to update your data feed. Otherwise, you’re paying to market 150 products that you aren’t currently selling. Worse, they’ll 404 in the Merchant Center and bring down the quality of your feed. In addition, when working with our clients, we ask for a dynamic file meaning that we pull in your new file of all your products every single day. We optimize those products through a custom tool and then upload it in Google Merchant Center. This should be done by someone who has Google Shopping feed optimization experience because many times when you try to do this on your own (or use one of the $50/per month automated app optimization platforms), you won’t have an analyst looking over the feed. This results in random keywords being added into your titles with inaccurate attributes. You’ll end up with a feed that isn’t fully optimized, and it could cost you more money in the long run. At Inflow, we do all of these optimizations in-house, which means that we don’t make cookie cutter optimizations like most of the tools out there. You should also cross-reference Google Shopping data with search volume and other ad data sources. Some key things to look at are conversions, search volume, and negative keywords for your Shopping ads. This is a great place to start looking for additional optimizations to add back into the feed. By analyzing the feed and campaigns from this level, it should help you steadily increase performance over a longer period of time. Optimizing your data feed is a powerful way to improve Google Shopping ads performance, lower cost per click, and generate more sales. We’ll be sharing more details on Campaign Setup and Execution in Part 2 of our guide—stay tuned! 16 AdWords (Google Ads) eCommerce Strategies to Maximize ROAS Discover our favorite strategies for improving AdWords (Google Ads) eCommerce performance covering Google Shopping Ads and more. Find out the exact strategy used to maximize ROAS for our clients. I've been working in the shopping space for over 5 years now, and have slowly watched it become a real game changer for many businesses. Over the last couple of years, I have had the pleasure to work with clients all over the world including the US, Germany, Australia, and South America. I've worked with the some of the largest brands and agencies, down to clients just starting out in the shopping space. I have managed almost all CSE's and Marketplaces including Google, Amazon, Bing, Facebook DPAs, Walmart etc.